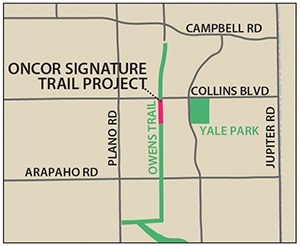 Landscaping improvements are coming to a section of Owens Trail south of Collins Boulevard as part of Oncor’s Texas Trails Program. Oncor, North Texas’ regulated electric transmission and distribution service provider, is providing $250,000 for the project, which will be maintained by the City. The section of Owens Trail being improved winds past Oncor transmission towers and lies within Oncor’s right of way. 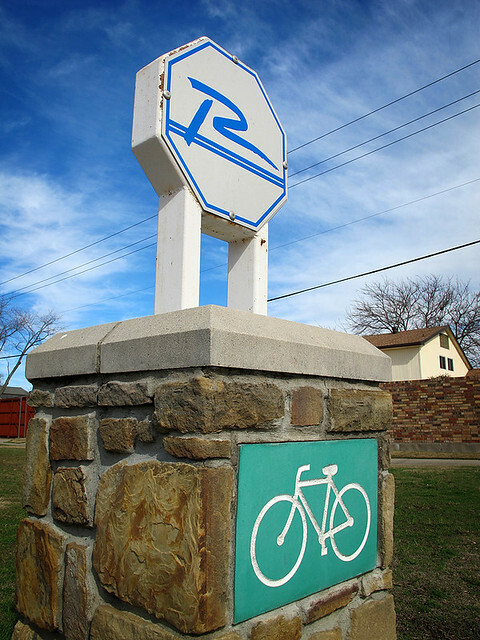 The improvements to the Owens Trail are designed to serve as an example of how Oncor can work with community partners to create landscaped trails that do not interfere with transmission lines. Construction is expected to begin this month and wrap up in April. On a personal note, this is good news for me. It happens to be in my neighborhood and on one of my usual routes. I can’t wait to see the completed improvements. Public / Private partnership at its best! Are they going to fix the stop signs where the trail crosses alleys so the alleys stop instead of train traffic?